Posted 2nd May 2012 by markjones in Accessibility. I am writing this from my own experiences, but would love to hear from you about yours, get in touch with me by leaving a comment to this blog post. Here’s an occasion where I felt a complaint was not required, I’ve not named the Operator – you know who you are. I went to Chester on my birthday with my Fiancée, brought a train ticket from the ticket machine at Rhyl, only later realising it had not given us the discount for a Disabled Railcard. So, we had a nice day in Chester, and arrived back in Rhyl that evening. I asked the gentleman in the Ticket Office for a refund, he asked me where I purchased the ticket (to which I pointed at the Ticket Machine) and he proceeded to hand me a form (which was not very accessible) and told me to fill in the form and send it in. I arrived home and thought I’d add the issue to FixMyTransport, but then I thought, why bother? Our particular train operator has not got a great track record of responding to customers – a quick look through their responses on FixMyTransport makes that clear. I binned the tickets a week ago, I was not going to complete an inaccessible form, I was not even going to attempt to contact the Customer Services department, Why? I just didn’t think it’d change anything. But now I think about it, I should have sent that message, for many reasons. – Publishing a message on FixMyTransport, even when the operator doesn’t respond very well, puts it out there in the public domain and shows other people with the same issue (even if it’s a really small one) that they’re not alone. – The more people join my FixmyTransport campaign, the more pressure there is on the operator to fix the problem, even if they’re not engaging as fully as they might. – The team at FixMyTransport, and other users, can often suggest what to do next when you’ve had no satisfaction. So, if the operator palmed me off, I could have tried a body like Passenger Focus. And if my problem had been a bigger one, there are all sorts of disability support groups to ask for help, there’s my local councillor, the local press, and lots more. Don’t be like me, Even if you don’t get a response from the operator the first time, keep going. Use FixMyTransport to report issues and to keep a record of any response you get. At the end of the day you will get an answer, it takes time, but you will be supported. 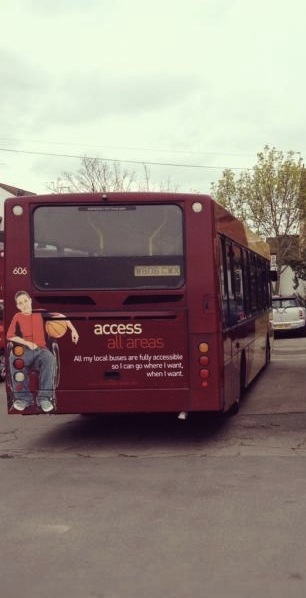 Image credit: Transdev Harrogate and District – used with permission.